Too many people create a subscription business because they heard it’s a lucrative business model. While it’s true that the membership model can help you scale your company faster, generate long-term stability and enable you to grow a vibrant tribe of thrilled members, generating revenue can’t be your only priority. Instead, when you focus on generating a positive impact on your members lives, they’ll reward you with membership and subscription growth. In a recent interview for the Membership and Subscription Growth podcast, I spoke with Tim Broom, the co-founder and CEO of ITPro.TV. Tim transitioned to a subscription business model four years ago and is set to hit $8 million in revenue this year. What he has done, you can do. Your product may be much different than his, but the keys to his success can be applied to any subscription model. ITPro.TV is, as Tim describes, “a Netflix for learning information technology.” They offer a low subscription price for access to a library of videos for people to learn and get certified in areas of information technology and security. At around $30 per member per month, they’ve experienced a phenomenal growth rate. Tim believes this success is a byproduct of having the right focus, value, and onboarding programs in place. The result of this transformation focus is an audience of loyal members who believe in your product and don’t hesitate to share their success stories with others. After adjusting your focus to be on the members’ positive outcomes, and then making sure you’re continuing to improve the quality for them, then next step in assuring your membership growth is to establish a customer success program. So many companies are so focused on getting new customers, and as soon as they sign somebody up, they’re on to the next one. Onboarding them and being focused on getting them engaged, and helping them get value is absolutely crucial. With a focus on each member having a successful outcome, continuous attention to the value of your product, and an onboarding system in place to ensure customer success, you have the three key ingredients to grow your subscription business and maximize your recurring revenue. 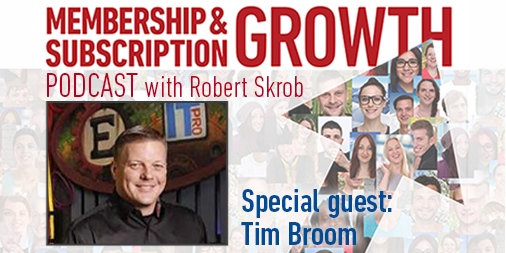 To access the full interview with Tim Broom and discover his tips for generating new customers and his advice for starting a subscription business, listen to the podcast or download the transcript. To continue to receive updated information and advice to grow your subscription business, subscribe now!